Spinning in the navy of the early evening tonight in the ‘rock room’, is one of the finest and most famous of the revealing ‘singer songwriter’ records to emerge from the 1970’s. Joni Mitchell’s Blue illustrates through its honest human expression and translucent melodies the exposed wires that comprise the complicated circuitry of the human heart. Mitchell was quoted as saying about the LP, ‘there’s hardly a dishonest note in the vocals’. There is hardly a wasted note in the delicate instrumentation as well, with lacy acoustic guitars and woody dulcimers creating bucolic and personalized aural scenes. Released on June 22, 1971 Blue is a serious album that communicates openly about the diluted schematics of relationships specifically Mitchell’s own scattered diary pages which find themselves lying weightless across the records cutting grooves. 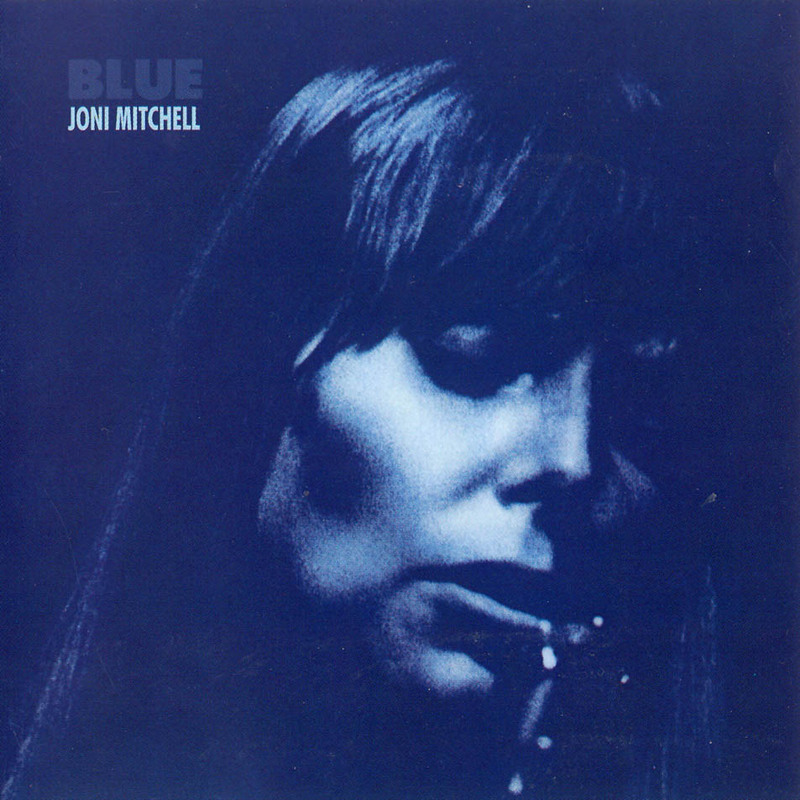 Mitchell’s recordings following 1971’s Blue would continue to examine the same personal themes but not in the same reflective perfection as Blue. Mitchell’s influence is drawn from her first husband, her relationship with Graham Nash as well as James Taylor, her lost child, unrequited love, love lost, love found and if love even exists. The aforementioned themes packaged in a exquisite blue and set to sail on thoughts of endless horizons and flowing waters. The albums rich hue is revealed with the opening ‘All I Want’, briskly strummed on an Appalachian dulcimer and woody acoustic guitar chords. Joni’s introductory vocal lines are held by the syncopated scrubbing of the collaborative strings and a soft percussion. Mitchell’s singing is drizzled in longing, the songs content drawn from the gray area between leaving one relationship while entering another. A spectacular opening. ‘My Old Man’ follows and begins with stately piano chords soon joined by Joni’s ‘bel canto’. Her falsetto is stunning adding to the emotional draw of the song. Contentment rings from the keys while Joni shares her unabashed dependence on the unnamed significant other a continuation from the wishful opening of ‘All I Want’. 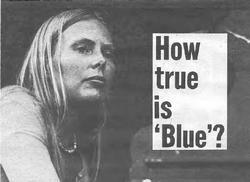 ‘Little Green’ is one of the songs from Blue that was mined from Joni’s past catalog for inclusion on Blue. Originally composed in 1967 the song was written for the daughter that Mitchell put up for adoption in 1965. 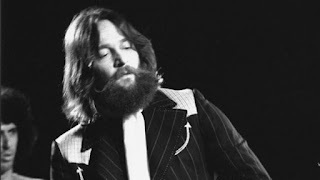 While the actual story would remain private for a number of years, Mitchell must have felt that the personal expression warranted inclusion on such a personal folio of songs as Blue. A crisp finger picked acoustic births a contrasting ‘green’ melody. The song delicately balances regret and hopefulness like a china tea cup on a saucer. Mitchell’s voice pours out hopefulness for her green child ‘when the Spring is born’ while internalizing the ‘blue’ weariness of the father leaving. When performing the song live in the late 1960’s Mitchell introduced the song by adding, ‘This is about a child who was born in Cancer and I hope that’s good’. ‘Carey’ picks up the tempo a bit, while again featuring dulcimer in addition to Stephen Stills making a special appearance on bass and acoustic guitar. ‘Carey’ moves with an organic pulse and a underlying joy. Mitchell herself has said the song is inspired by her traveling times, specifically people encountered when she lived in a hippie community in Crete. This is probably the most ‘grooving’ song on the collection, a great cut. The album’s title track ‘Blue’ closes side one fittingly with the opening line expressing that ‘songs are like tattoos’ over a solitary piano. The song is impressionistic in its intent while also carrying a commentary on the unfathomable waves of loss and despair washing over our narrator. Imagery of the sea and of the piercing of flesh intermingle, permanency and its eventual erosion also play out through the churning piano and Joni’s rippling voice which diversely dips, flits, bobs and weaves. Joni has been out to sea and nothing has been washed away. It's nice to be able to take a breath while flipping this record, it's needed. One of Joni’s most beloved songs, ‘California’ opens the amazing side two with a warm optimism and sunny admiration for her home. 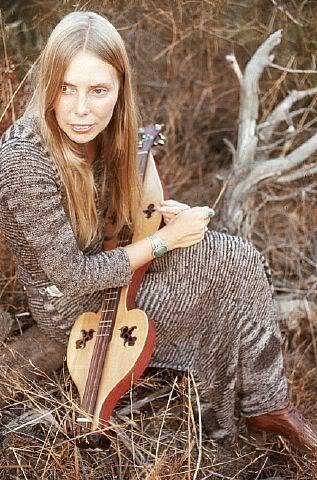 Sung from overseas with a delicious optimism, Joni’s voice melts over well timed pedal steel and a groovy airy melody. James Taylor makes an appearance on the song lending some country funky acoustic guitar. One of the finest songs on the LP because of Mitchell’s revealing sentimentality and expressive siren voice. Like another paean to California, ‘L.A. Woman’, the song is a nationalistic anthem for the lost and hopeful hippies of the time, the feeling that still exists today. The uptempo feel of side two continues with, ‘The Flight Tonight’, a churning acoustic number with a darker feeling than the preceding songs. Rock band ‘Nazareth’ would increase the popularity of this Mitchell ‘B’ side with their own hard rock version in 1973. Content wise the song slots into side two by expressing the immediate regret of leaving someone behind as a flight takes off into the sky. The ‘rock room’s personal favorite of the album comes next with ‘River’. Performed by Joni solo on piano, the ‘ant-holiday’ song beautifully quotes ‘Jingle Bells’ in its opening melody. The song deftly revels the receded feelings that the holiday times can pull from inside. The imagery of the frozen water, cut trees and no snow contrast with the memories of dusty Polaroid’s on the mantle. Mitchell’s admission that she ‘made my baby cry’ increases the intensity of the icy notes from her piano from which the songs of the holiday’s bob their recognizable melodies before submerging again under the ice flows. The ‘river’ is Mitchell’s only escape from her created regret, selfishness and sadness. The song is awash with perfection from its melody right down to Mitchell’s icicle vocals hanging crystalline from her winter eves. The acknowledgement of regret is so strong that it becomes beauty and Joni’s piano only affirms this reality. Wow. The dulcimer strums another famed Mitchell composition with ‘A Case of You’. This is an additional Mitchell song that has been covered a number of times by a plethora of artists. This song is supposedly influenced by Graham Nash and spotlights a bird’s eye view of a lovers conversation in addition to scattered remembrances of her lover brought to the surface by the narrator in differing scenes. The buzz of alcohol is compared to the drunkenness of love by Mitchell with desire running through her veins; as even an entire 'case of you’ would still allow Joni to remain on her feet. The album closes with the anticipatory extended piano introduction of ‘The Last Time I Saw Richard’. The song is all raw exposure and the uncomfortable reality of a love between two people reaching its inevitable conclusion. The song is purported to be based on Joni’s first marriage to ex Chuck Mitchell. In the song the male half of the relationship acts as the ‘old guard’ and what must be left behind. ‘Richard’ takes the opportunity to deflate our narrator’s optimism by stepping on the ‘moon in her eyes’ and pulling her head from the clouds. The song exhibits a tremendous sense of place which character portraits of ‘the dreamer’ and the ‘the realist’. The truth is in the details, the waitress, every light being on in the house, all representative of the influence of dying love. Like, ‘Blue’ which closes side one, ‘The Last Time I Saw Richard’ epitomizes the whirlpool of emotions explored on the entirety of the record. Both songs bookend one of the most probing and truthful explorations and expressions of the human spirit and relationships ever committed to record. The 1971 album Blue consolidates the human condition into a relatable and transportational collection. The music contained within is what takes the message into the crevasses of understanding. It’s art like Blue that allows us to adhere to the music and its creator and use their expressions as reflecting pools into our own lives for deeper understanding. Mitchell’s gift for observation and dissemination as well as composition and instrumentation is critical for delivering her beautiful musical analyses.